The movement of Russian forces into Georgia in the past few days is the most significant event since the end of the Cold War. Russian forces continue to pursue aggressive military operations deep within areas of the sovereign state of Georgia: these include the bombing of the civilian international airport in Tbilisi, bombing raids outside the disputed separatist region which have resulted in large numbers of civilian casualties, attacks on critical infrastructure in the Black Sea ports of Poti and Batumi amongst others, on depots for energy supplies, and on military sites. Where it will end is unclear, but Russia's strategic aims are only too plain. Even the most dispassionate observer cannot fail to see that Russia will have, at least in her view, more to gain here in war than in peace. She has effectively stamped her mark on the regions that left the fold after the collapse of the USSR, Georgia is being made an example to all the other newly independent states that distancing themselves from Mother Russia is a dangerous business and potentially an existential threat. The US and EU recognise the territorial integrity of Georgia, which includes the disputed areas of Abkhazia and South Ossetia. It is most regrettable that fighting and loss of life, all too familiar in both the North and South Caucasus, has again broken out. More so as this coincided with the beginning of the Olympic games and discussions within the last few weeks of a ceasefire which might have led the way to a lasting peace in two regions. Whilst it is tempting to blame the actions of Saakashvili, as many media outlets have, for Russian aggression, this view fails to appreciate the magnitude of tensions in the border regions and the regular skirmishes that occur in these areas, as well as the need to defend civilians on both sides of the disputed region. If, as the Russians claim, they have simply acted to protect their citizens, in regions in which they have "peacekeeping forces", then the international community must be obliged to look on with suspicion as they clearly targetted areas well outside of the region which they purport to be protecting. The level of their response and incursions into the heart of Georgian territory and escalation into Abkhazia, a separatist region running along the Black Sea coast (General Serge Chaban is reported to have said a further 9,000 Russian troops are being sent to the area, together with 350 armoured tanks) makes their claims that military action was primarily to protect South Ossetia look disingenuous. There can be no mistaking that the Russians have seized full advantage of the situation. Their military preparedness for the fight points to longer term objectives: to regain their sphere of influence, and to send clear unequivocal signals both to CIS nations that have chosen to pursue membership of Western organisations and to America herself. Russia has consistently used strong arm tactics against its neighbours who do not fall in with the Kremlin's view of what is best for Russia and the region. It's now well accepted that the use of energy as a geopolitical tool, which we wrote about as early as 2005 ("Russia's Gas Weapon: Gazprom Rising", Ziba Norman, International Herald Tribune, 21 December 2005) has remained a mainstay in its arsenal. Russia may also be keen to control the flow of energy from the Baku-Tbilisi-Ceyhan pipeline, a major energy corridor to the West and the centrepiece of West's long term plan to diversify the sources from which it draws supplies, hitherto outside Russian control. And there are reports that Russians have bombed areas close to the pipeline in Georgia. Russia is determined to scare off NATO, and has on many occasions stated categorically that she is the only guarantor of security in the region. But the history of the Russian empire in their near abroad means that she is not trusted, and many of the CIS nations do not feel comfortable looking to her for security guarantees, more so given Russia's history of supporting separatist movements in the knowledge that keeping these movements alive will hamper stability and prosperity in countries which she seeks to control, and where self-determination has led towards an embrace of democracy, western values and away from the authoritarianism preferred by Russia. As civilians die and a sovereign nation on Russia's periphery faces a battle against overwhelming force, the world looks on apparently helpless. Georgia's allies have been able to offer little more than strong condemnation and vain hopes of ceasefire, and claims that the Russian response was of an inappropriate level. Georgia reportedly has withdrawn and called a ceasefire, but the Russian aggression in all parts of Georgia continues. Can Russia really only have intervened to support their citizens in South Ossetia? So this is a defining moment, and Putin wishes to take full responsibility for what he sees as Russia's declaration to the world that she is again a great power. He has taken a very personal and hands-on role in this. It is no accident that it was Putin who left the Beijing Games to go to North Ossetia and not Medvedev (President of Russia). Georgia's NATO aspirations, which made this show of force on Russia's part the most predictable of scenarios, cannot be allowed to be the blocking mechanism that the Russians intend it to be, to prevent an independent nation from taking her own course. America must make it clear that it will defend her friends with all the means at her disposal, and ensure that any designs on full scale occupation of Georgia, with the intention of ousting a democratically elected government, will result in punitive measures being taken. Clearer messages from the US at an earlier stage might have been all that was required to stop an escalation of the conflict and the re-vamped Russian army from trying out their new boots deeper and deeper into Georgian soil. Ironically a more robust response by Bush personally, at an earlier stage in the conflict, might well have resulted in the immediate ceasefire that the world community called for, but dared not demand with menaces for fear of exacerbating the conflict. As it happens the failure of leadership will simply embolden the Russians. And America's feeble response will be read as both a lack of interest and an acknowledgement of Russia's superior status in the region. With every hour that passes America's influence diminishes, together with the hopes of all those who value freedom around the world. 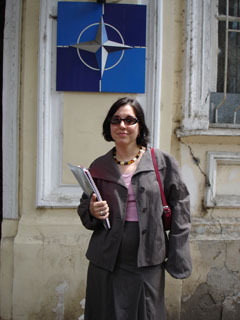 NATO membership for both Ukraine and Georgia is not a luxury that can be ponderously contemplated, it is a must for their survival and the security of both America and her European allies.